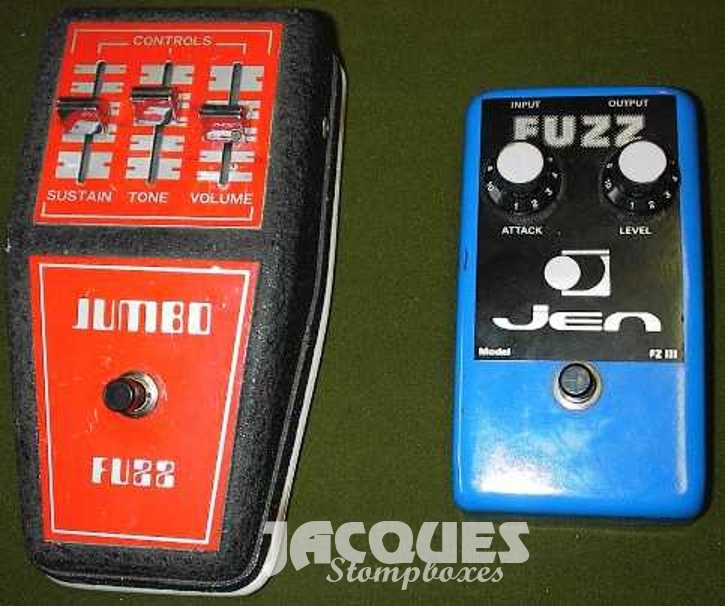 Pedals brands can issue new effects making your guitar sounds like an organ, a piano or your deceased aunt voice, it all started and will end with this scandalous tone of fuzz. 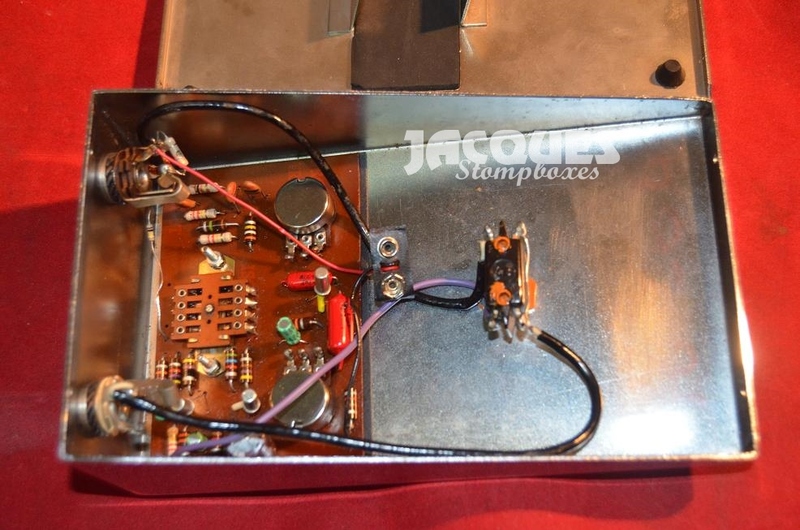 Let’s face it : the whole history of music has changed with these dirty two transistors wonders that gave guitar a leading place in all kind of music. 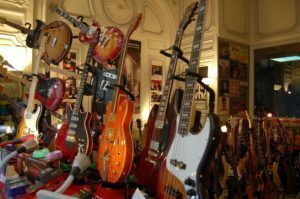 If you play electric guitar, you know that is the tone you want and that you will never regret buying. Even several of them. 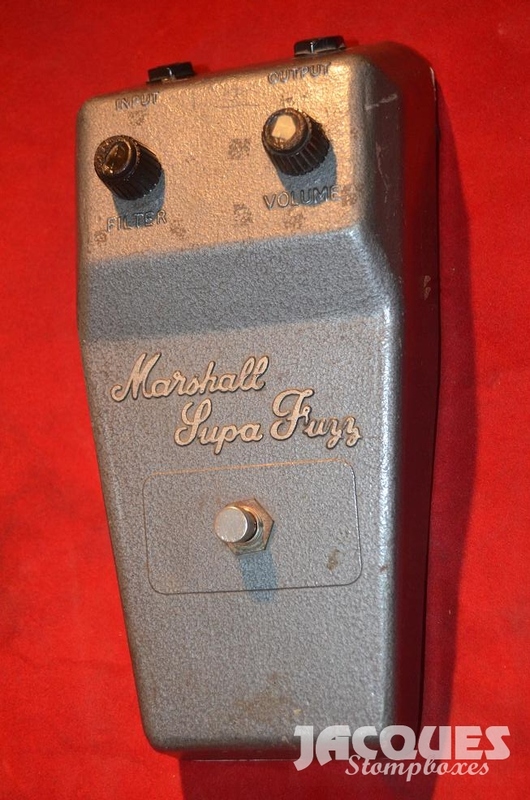 This page is about my personnal collection of vintage fuzz pedals, which are a favorite of most collectors. Why ? Usually they are very simple circuit anyone with a soldering iron could replicate. 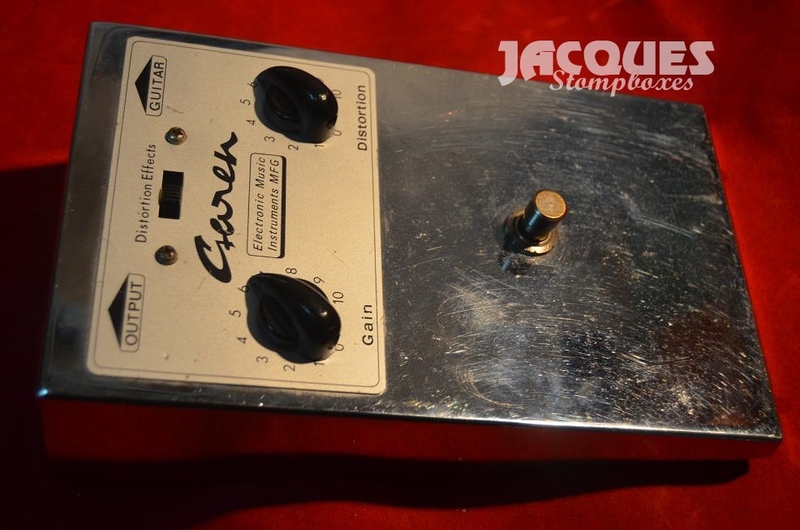 But the thing is, with simple circuits that EVERY component can be ‘heard’ and thus each pedal has its own signature. Tonal differences are not small if you swap any of their components. And their enclosures, with the beautiful sign of time, are the best time capsule I could think of. 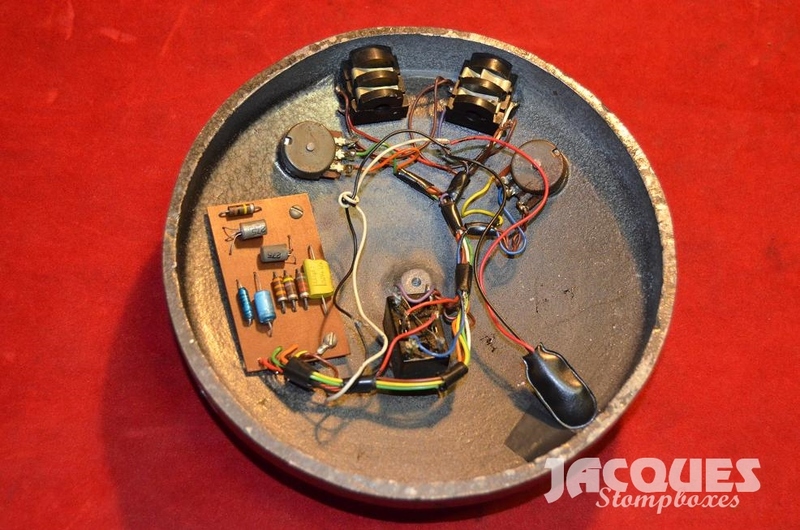 Most of the most expensive vintage pedals are simple circuits in an old box. I have sorted them by country of origin. The transistors look like modern ac128 but they are blank. 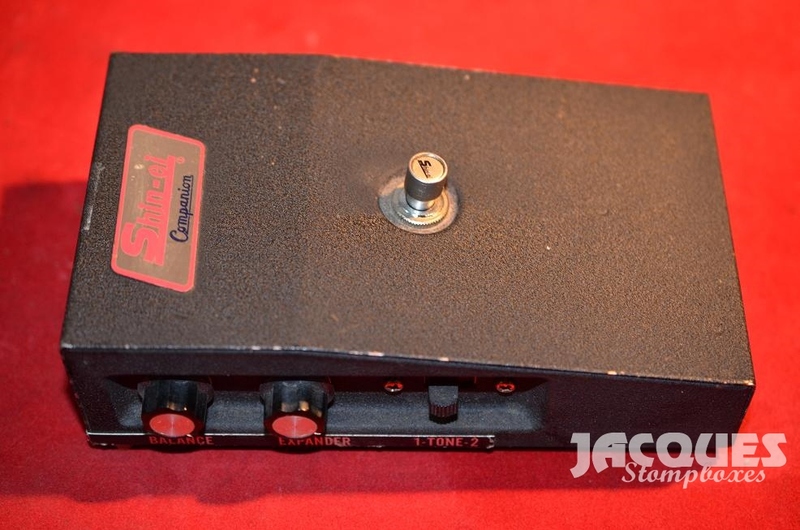 A very useful and nice feature of this pedal is its filter switch : works like a fixed tone with 3 positions. This baby fuzz is more obscure and there is no real proof she’s french. I base my belief on the lettering which was very up to date in the early ’70s in France. And from its knob : I had the same on my car radio. 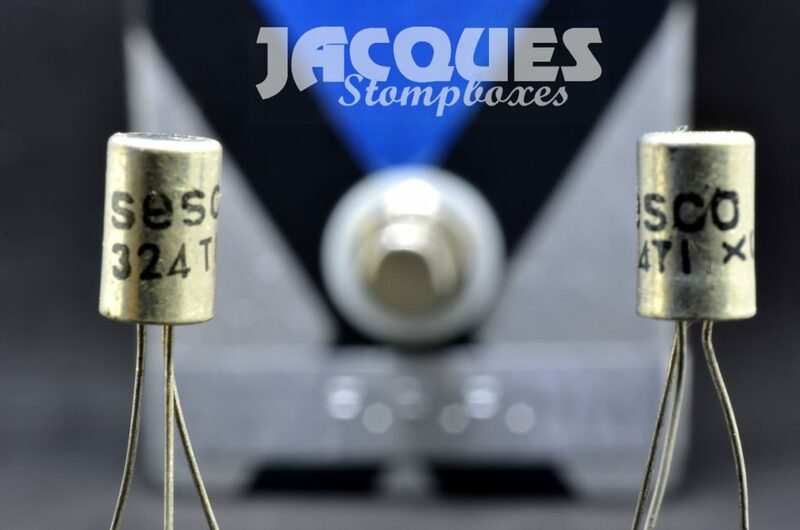 It is worth noting that transistor were produced in France since 1946 , and one of the best fuzz germanium transistor is for me the SESCO ( Societe Europeenne des seim-conducteurs ) 324TI …. too bad I seem to be the only one to own a few…. This is much more obvious, of course . 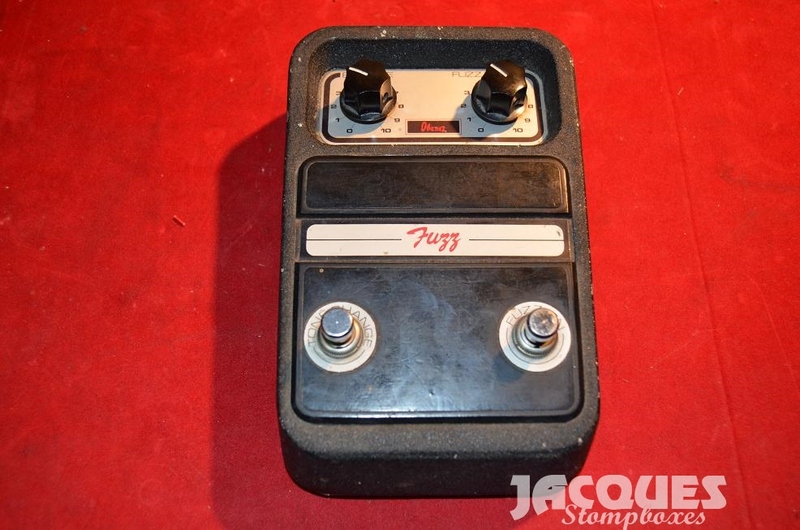 I started my collection with the pedal you can see at the right of this picture : The uncanny companion fuzz from Shin-ei .At this time –I was 15— I simply bought it because it was the cheapest : how could I know this pedal could become so collectable now ? But I just fell in love at first note : I could at least get a REAL guitar sound. 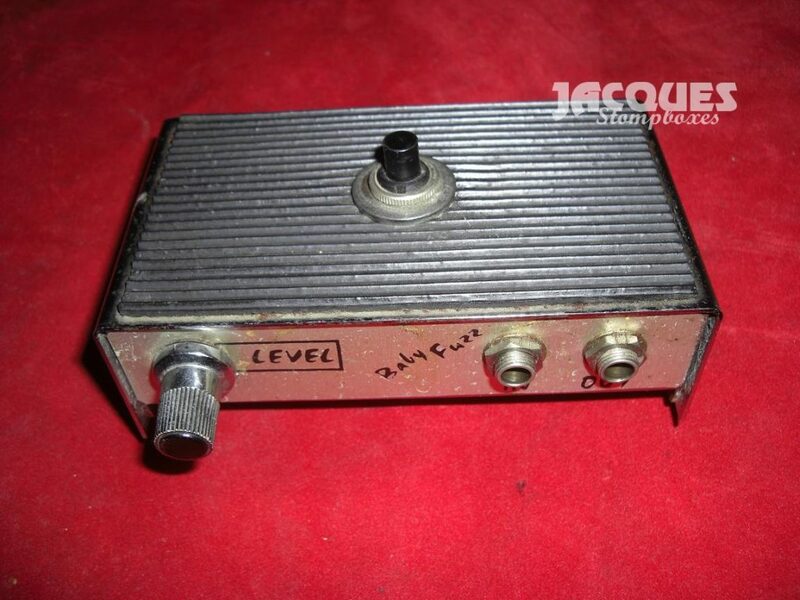 It is considered nowadays as a very rough square signal buzz tone, but its nasty fuzz tone still turn heads. And of course a look at its circuit, which , as you can see, is quite complicated if you compare it to a fuzz f ace. 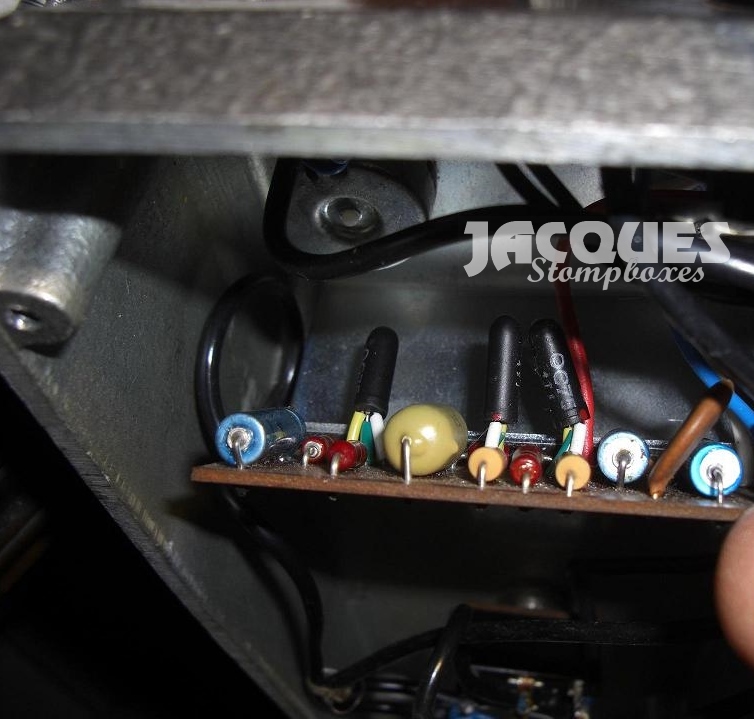 It use high gain ( between 450 and 500 ) plastic silicium PNP transistors, my personnal favorite being the BC239, preferably made in France or Germany, while you have a numerous choice of great devices which can do the job. Electrolytics are important too. The OC75 used here are a kind of AC128 too but made by Mullard in England or Valvo in Germany. They are very good and consistent transistors. They come in black but sound the same if they are not. 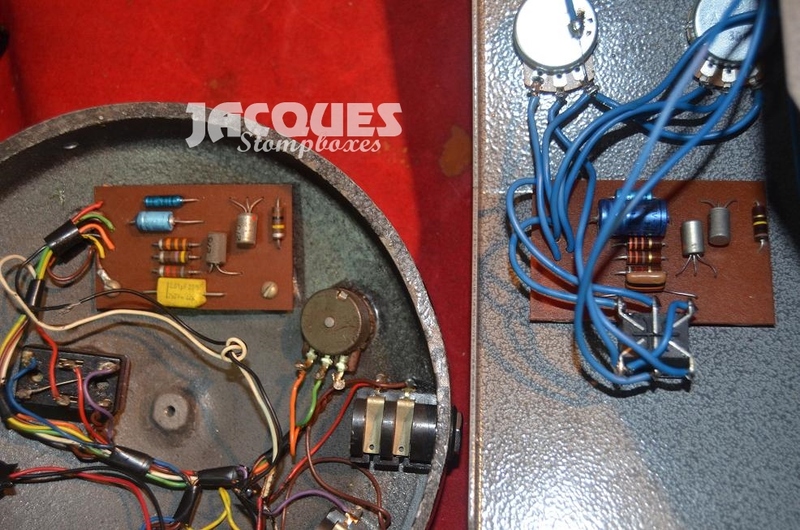 All these are PNP transistors, and even if you don’t care, please consider that the metal enclosure is usually connected to the + side of the battery, which means that if it comes to your mind to install a DC plug on these pedals, you will have a short circuit in case it touches another modern pedal, which enclosure is to ground. Don’t do it. And it is true saline 9v batteries give these fuzz a nice sag a la rectifier tubes. 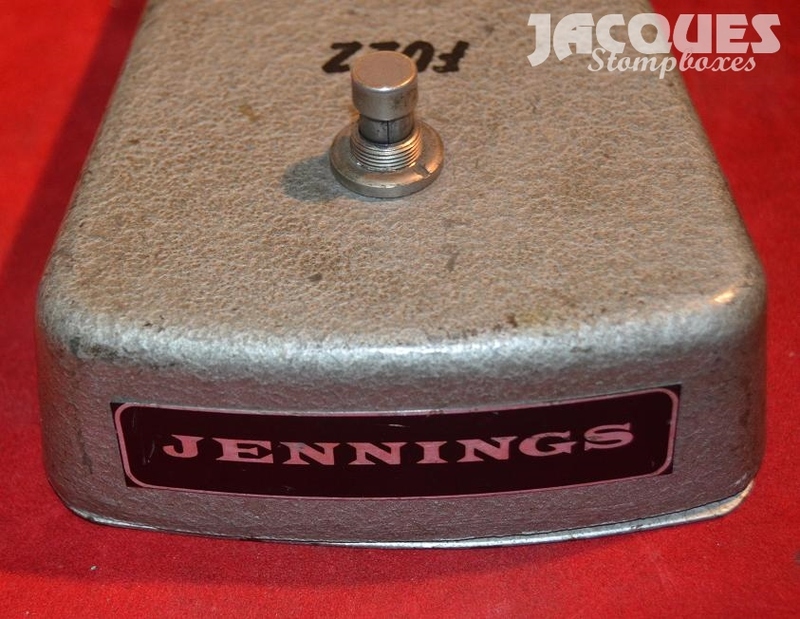 My rare jennings fuzz is a beauty : it uses rare silicium white-head ME4102 transistors . Think silicium fuzz face in a good day. From the VOX amps inventor, my friends. Because vox of course entered the bandwagon before that. 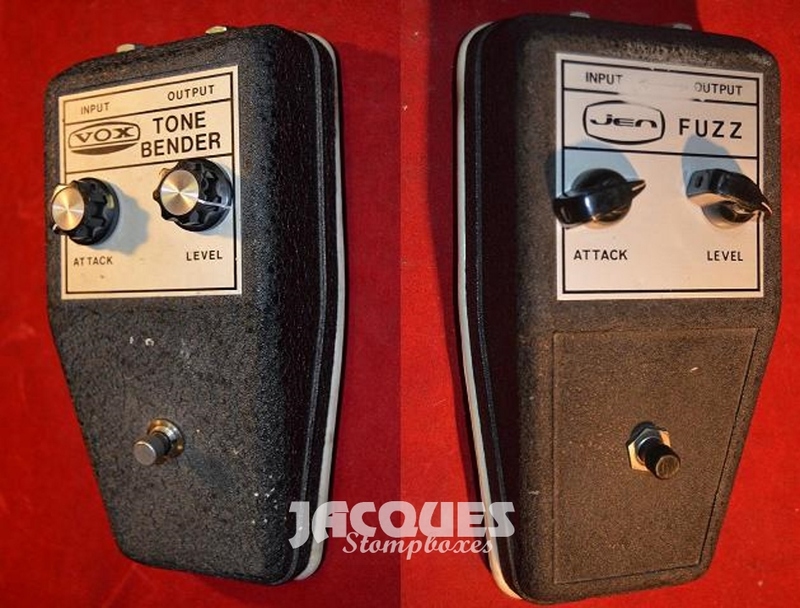 Here you have on right hand an old english vox tone bender with its colorsound more modern version. 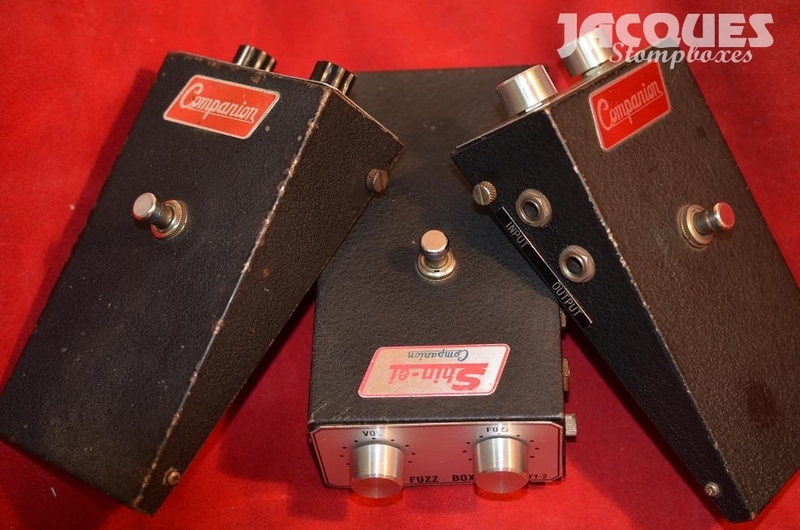 Both pedals use germanium , while colorsound went silicium on their bigger jumbo rendition. 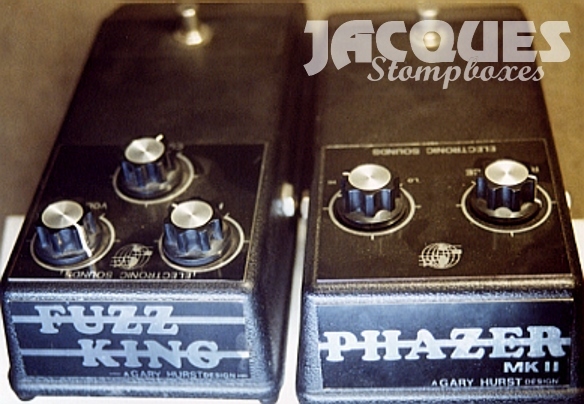 You may have noticed most english fuzz pedals are painted with hammerite paint, usually grey. This paint was everywhere in my youth but mostly on anything professional : tools, desks, office cupboards, office armchairs, etc … it really means one thing : You are at work. Work implies serious stuff. I suppose it was a way of protecting them from abutse and that was the way musical instruments executives see that trend: a worktool. Later, they start smoking. 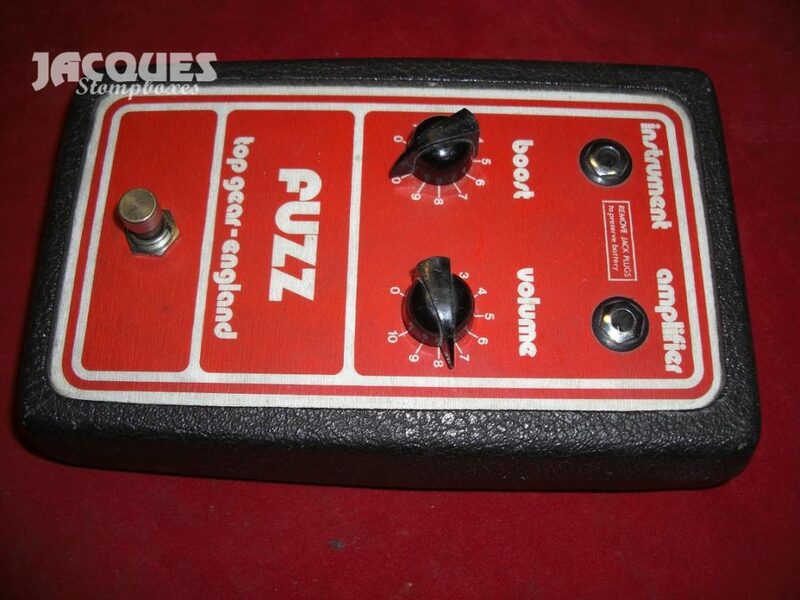 This london aka top gear fuzz is quite an exception : its enclosure is made of wood covered in leatherette . Like an amp. One could guess time would have destroy them but they’re still here. I would still prefer hammerite metal over this nice arrangement. Another very good supply source. 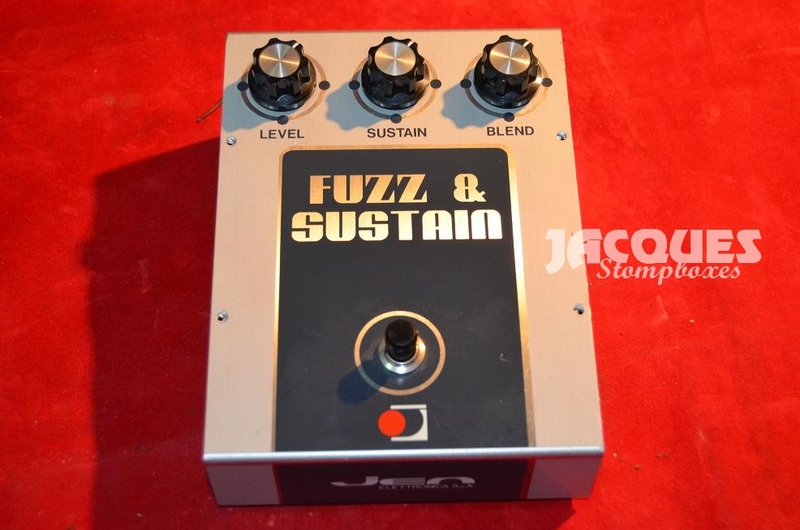 Italian makers went head first on the new fuzz pedal market with great designs and ideas. 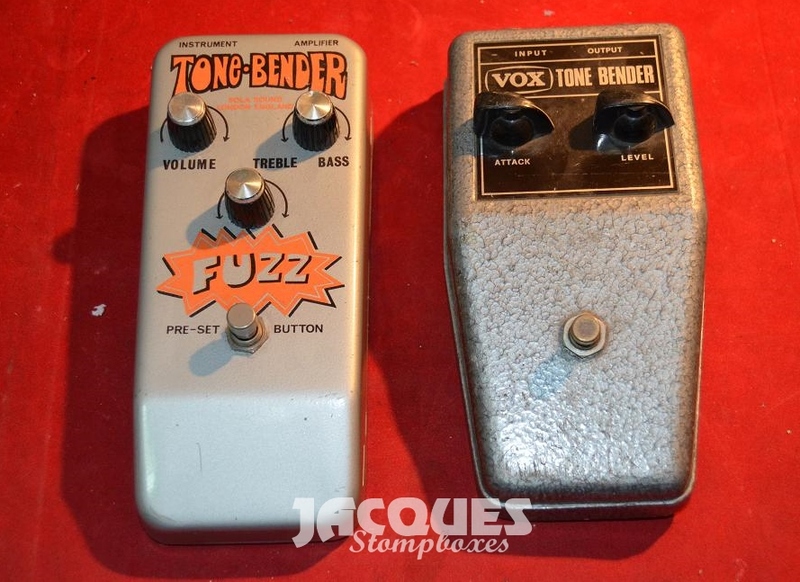 Their 1st pedals certainly came from subcontracting vox . 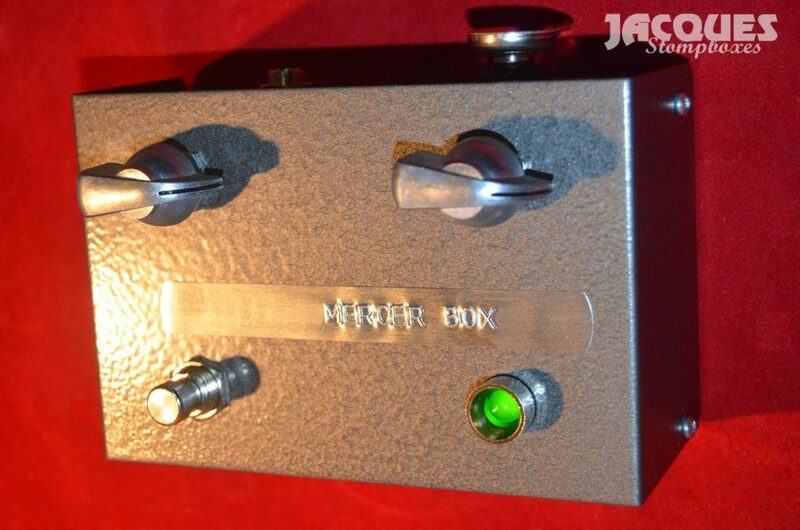 Italian made vox pedals have their own personnality while the enclosure shape was a copy of the original vox ‘foot’ shape enclosure. To fuel the growing market , they made them under their own JEN brand. The Jen factory was located in Pescara and was really skilled in musical electronics up to synthetizers. 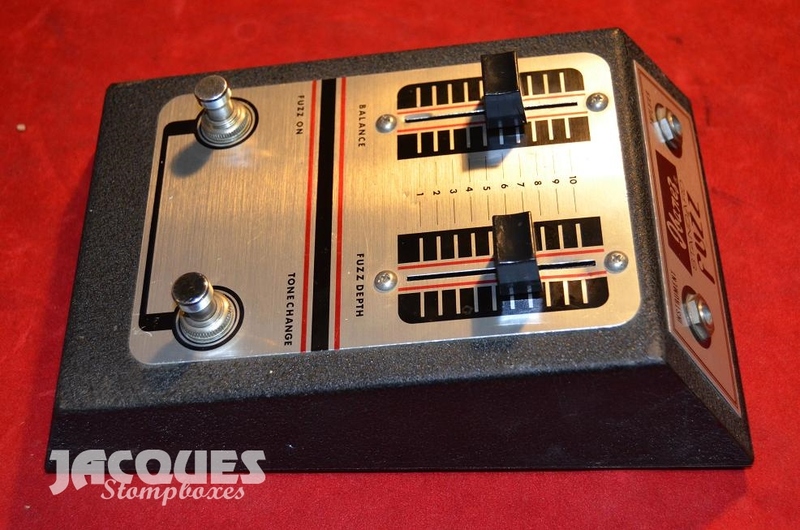 They use this enclosure with numerous pedals. The 3 slits could be used for sliders like here, but were also fitted with a round hole for classic pots. Then they used this small blue box with several brands. The black knobs could be found on guitars too and are genuinely italian. 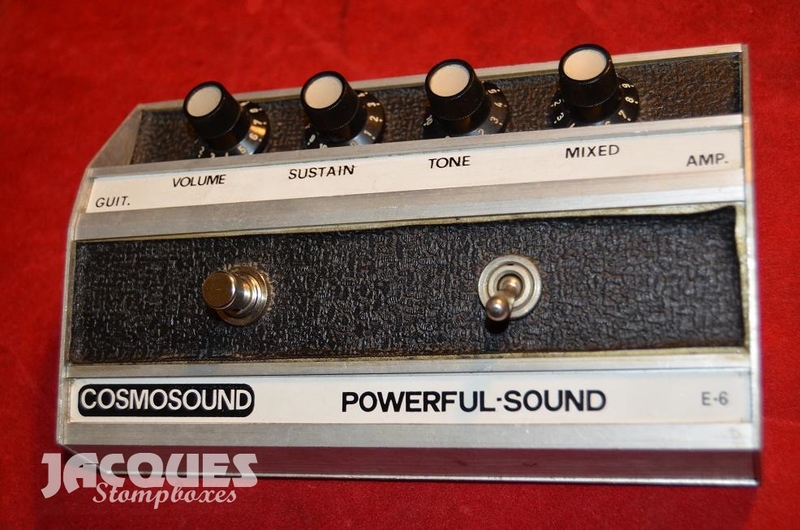 They eventually went to a more big muff like design, but still it has a nice classy italian touch. 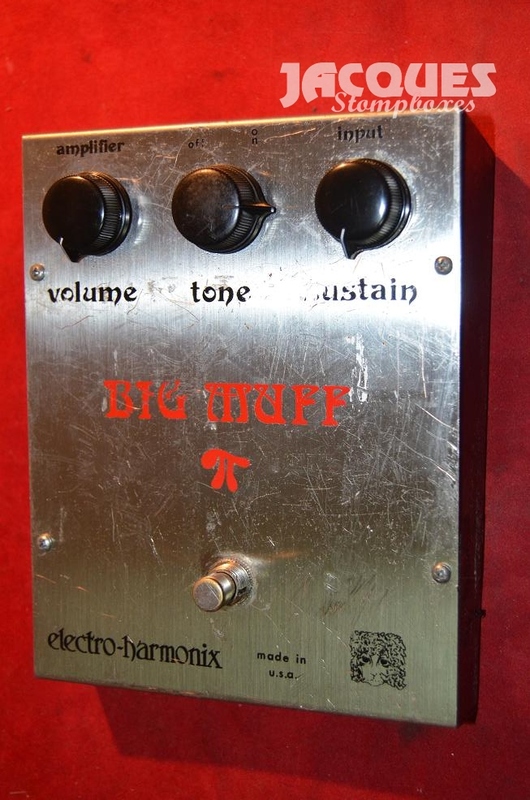 Sounds like a big muff too as we are now for from the english fuzz origins. 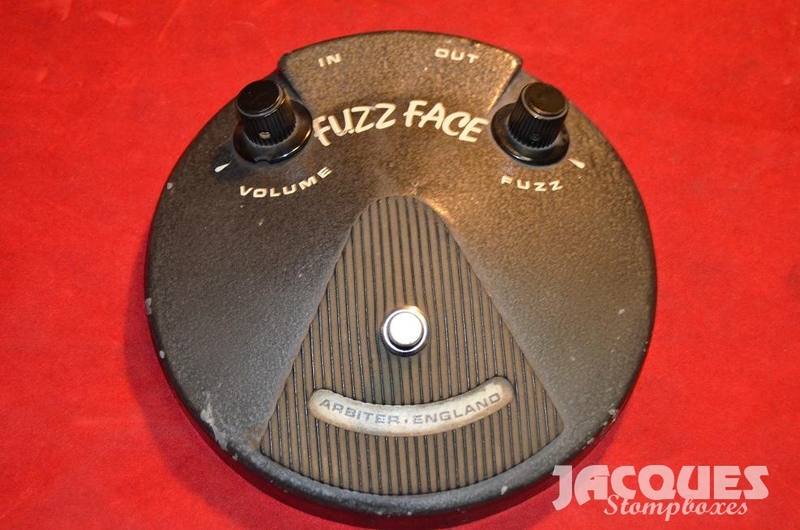 This fuzz king from electronic sound is a rare bird which bears the Gary Hurst signature. Mr Hurst is the inventor of the tonbender but there is few information of this italian connection. Those pedals were made in ABS moulded plastic but well made circuit wise. They are quite rare and expensive now. 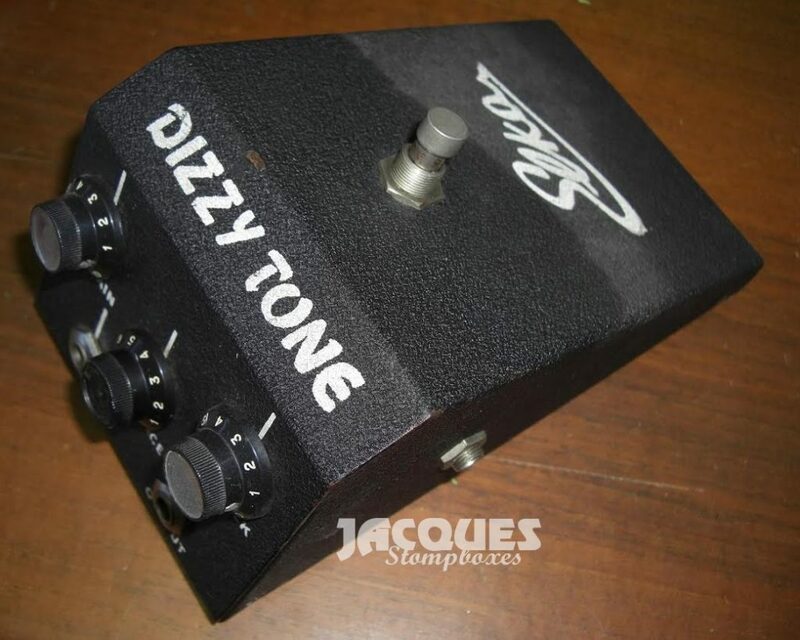 Last but not least, the rare and expensive Elka Dizzy Tone , which was made with French SFT transistors. 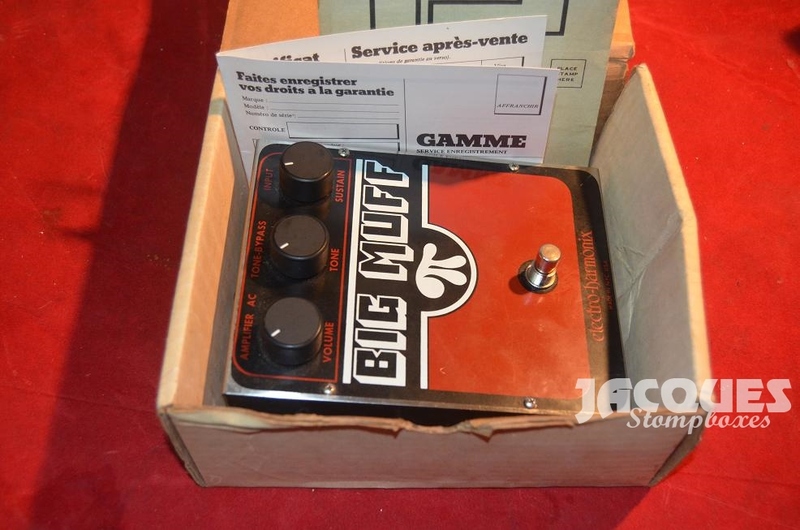 So that’s conclude my fuzz pedal personal history from the companion shin-ei bought in France in 1974 to the big muff purchased in London in 1977. 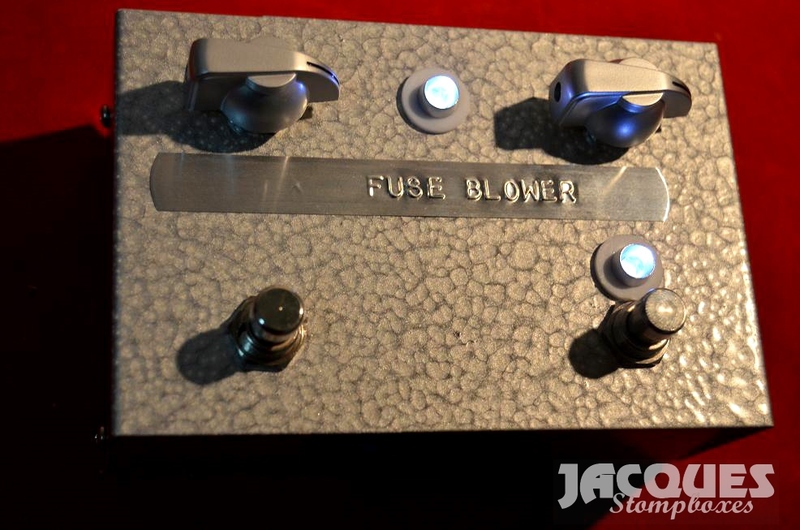 I also have my own designs based on the Mercer Box for germanium and the Fuseblower for the silicium, they both represent my own vision of what is the very sound of fuzz.